We are glad to tell you that meet me at KHADIA group operated by Ashish Mehta is an active group since 2014. The group has been consistently working for our culture and heritage. Under the group, we have done many activities for the last three years; like promoting our walled city of Ahmedabad through stronger campaigns on social media as well as doing many different kinds of the walk. Our motto is to make people aware of our culture through different kinds of creative events. So now I Ashish Mehta am pleased to announce one different kind of creative event in pol area which has four aspects; one is Panel Discussion, second is Music, third is Photo Exhibition & fourth, Chai-Street Food. 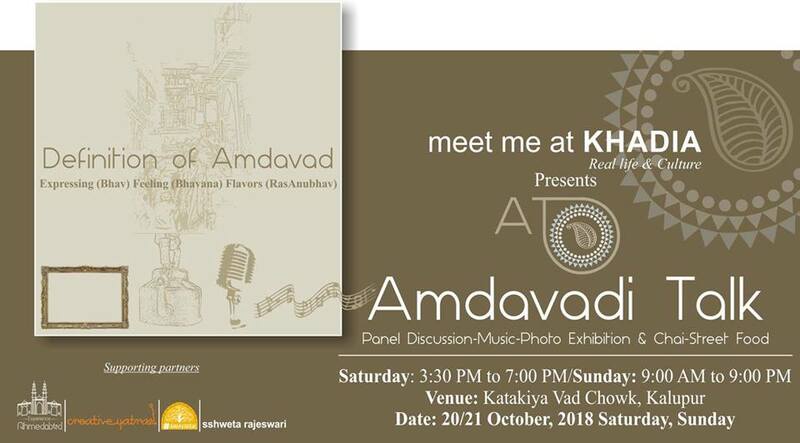 This event is ‘Amdavadi Talk’.